I freaking love falafel, and for some reason I’ve always enjoyed the baked kind more than the fried. Maybe it’s memories of greasy kebab shops with crispy oily falafels that leave a coating in your mouth. Maybe it’s the fact that you can put them in the oven and leave them be to do their thing without too much worry. Whatever the reason, they rock. I actually made this recipe back in Gympie when we were living in the van. Oh, how it seems so long ago…cooking in our tiny fold out kitchen on the side of the road or in the bush. Those were the days! I didn’t have an oven then to bake them, but have since made the recipe again and enjoyed it as much. What I liked about these is how moist they are, they don’t dry out even when baked. Rather than being like dry biscuits, they are like mouthfuls of creamy hummus. And who doesn’t love hummus?! They are also one of those magical foods that taste even better the next day, so they make great leftover lunch. Of course, tabouli is the perfect match for falafels, and I love the hint of mint hidden away in it – so fresh and zangy. Oh and the parsley helps with the garlic breath you may find you have after eating all this. You’re welcome. Rinse and cook quinoa according to instructions. I usually do 1 part quinoa to 2 parts liquid. Allow to cool. Add quinoa, tomato, cucumber, red onion, parsley and mint to a bowl and toss to combine. Whisk garlic, lemon juice, olive oil and salt in a small bowl. Pour over tabouli and mix through. Ta-daaaaa! Chill in the fridge until ready to serve. Preheat oven to 200C and lightly grease a tray. Blend onion, garlic, parsley and coriander in a food processor or blender. Add half of the chickpeas, cumin, paprika, lemon juice and tahini and mix until well combined. Add the remaining chickpeas, and pulse until just combined. I like to leave half of them kind of chunky. Transfer mix to a bowl, and stir in flour and baking powder. The mix should be like a thick paste or soft dough and you should be able to roll it into balls without making too much of a mess. If it’s too wet, add a little more flour. If too dry, try adding some more lemon juice or water. Roll mixture into balls and lay out on the tray, press slightly to flatten into disc shapes. Spray or brush lightly with olive oil (optional). Cook for 15 minutes, then carefully flip each falafel over. Bake for another ten mins, until golden brown. Thanks for leaving some in our fridge LVB. They did not last long. Gone by lunchtime the next day! Oooh! I’m going to say there’s a 50/50 chance there, haha. Maybe the parsley would be too strong a flavour for him? Or does he like that kind of thing? When my cousin was little, he lived for olives. I couldn’t believe someone so young would like such an intense flavour! Each to their own I guess. This looks like a bowl of amazing goodness! Yummmmm!! Thanks Kayse! It’s such a healthy, filling meal! 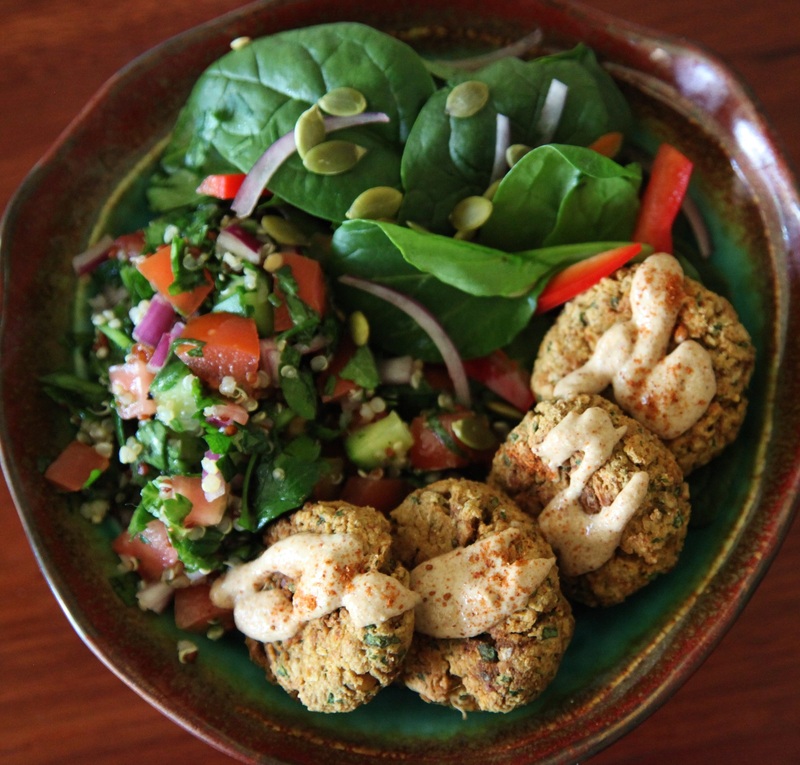 I love falafels – and these look so good – what a nice healthy bowl of dinner. I love falafels baked or fried and haven’t made them for ages because I love the ones they make at our local falafel shop Half Moon Cafe – I really love how green theirs are. I am curious if you had a food processor with you when you were in the van or did you just use a fork to mash up the chickpeas – impressed you made them in the van! Oh my gosh, I need to get to this Half Moon Cafe – lately their falafels are ALL I hear about! Seriously! Three people at my work were all talking about them the other day, and then another friend mentioned them shortly after. They are infamous! We did have a little stick blender in the van – we could only use it when we plugged the van into power as the blender was too powerful for our little battery inverter. 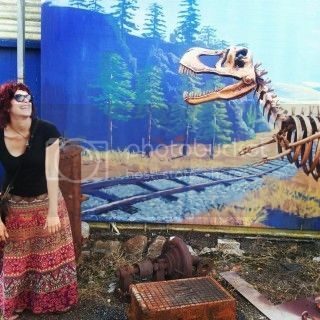 Ha ha – really roughing it right? It was quite funny, we would get really excited on the days we were plugging into power because we’d get to have smoothies for breakfast. Once we found a power point in the middle of a park, and sat there making smoothies hehe. Oh yum! 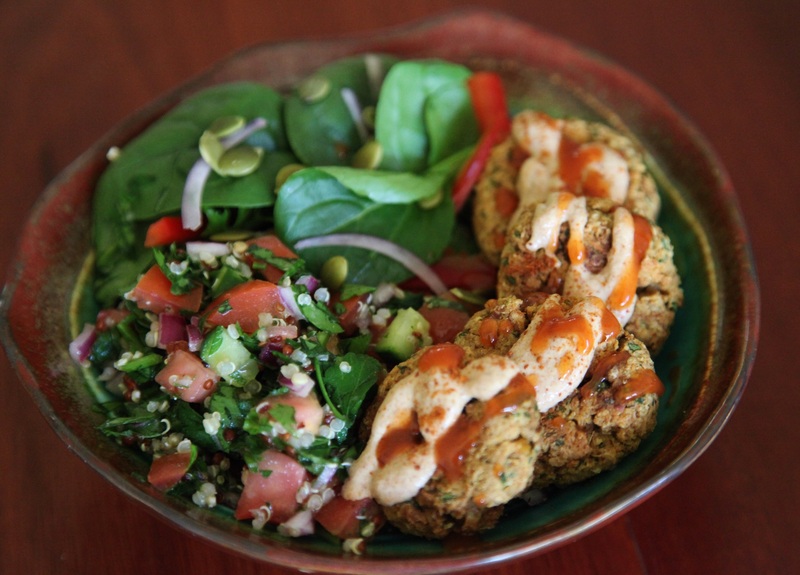 Is there anything better than tabouli and baked falafels? Ooh, peanut butter falafels – oddly I like the sound of that! Very resourceful! Ha ha, ohhh, each to their own I guess. I imagine it is a strange flavour and texture for little mouths, maybe in a few more years 🙂 Glad you enjoyed it at least!